← The Adjustable Rotary Cutter: Is it right for you? What has 8 sides, 8 angles, and a near-perfectly crimped edge? 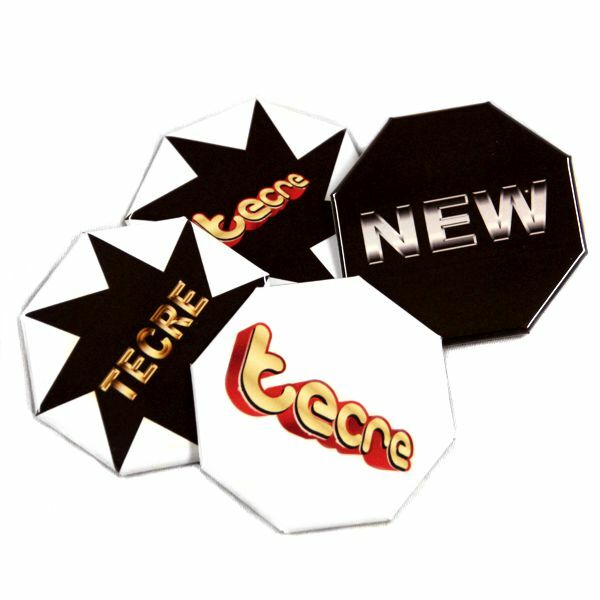 If you thought of a stop sign, you’re on the right track since Tecre’s new octagon button is capable of halting traffic. The stand-out new shape is the opposite of subtle. If you are not someone that likes to be noticed, this may not be the button for you. Beyond standing out, the new octagon button flaunts the features claimed only by the Tecre-made button. Pristine folds. Tight Crimps. Meticulous angles. The only difference is this new button does it 8 times over. Tecre’s new octagon button is an engineering masterpiece to behold. What is the best way to welcome this audacious new size to the Tecre Button family? Request a FREE sample! This entry was posted in Button Making Supplies, Company News, Manual Button Maker Machine, New Button Making Products and tagged Button maker, button making, button making kit, Button making supplies, Button Supplies. Bookmark the permalink. Yes! This dieset is available for both the Model 152 and Model 1095 Electric Button Making Machines! Would you like us to send you some samples? Hi Ulisses! Feel free to send a sample request to tecresalesteam@tecre.com! Thank you Gaurav! It’s certainly a show-stopper! Thank you! Please email tecresalesteam@tecre.com for a quotation.